This �bay of blood� set somewhere in the Faroe Islands is where hundreds, sometimes thousands of pilot whales are literally butchered alive by hungry locals. The hunt known as Grindadrap is centuries old and it hasn�t changed much since then, except for the power-boats, radios and echo-sounders which make life a lot easier for the butchers. They round the poor whales into the shore with the power-boats and when they get really close, the locals plunge into the waves and start hooking them to death in a horrific manner. Then they drag the carcasses to shore and start skinning them and splitting the meat and blubber between all the islands� inhabitants. The Faroes economy relies only on economic fishing, but that doesn�t give them the right to slaughter 544 Atlantic white sided dolphins in a single day, like they did in 1988.
recently, studies have shown that the meat and blubber of pilot whales contain high amounts of mercury, PCBs, DDT and dieldrin. For what they do every year these animals deserve to get much more than mercury poisoning. I believe Avicenna has said that there are three types of people 1: human 2- animal behavior human 3- humans who do things that even animals don�t do. A Whale of a Killing in Denmark -Truth! & Fiction! An eRumor with graphic photos written in Spanish about the hunting of pilot whales on the Danish Faroe Island as a right of passage. The Office of Protected Resources, an US government agency responsible for protecting marine mammals and endangered marine life, have confirmed that long finned pilot whales are being hunted. According to their website the pilot whale continues to be hunted and slaughtered on the Faroe Island which lies between Denmark and Iceland in the cold Atlantic waters but there is no danger of this species becoming extinct. The Office of Protected Resources falls under the Fisheries Department of the National Oceanic and Atmospheric Administration (NOAA) in the Department of Commerce. Long finned pilot whales are part of the dolphin family and like all marine mammals they are a protected species in the United States but classified by the NOAA agency as a "Low Risk Least Concern." In the North Atlantic there are about about 750,000 long fin pilot whale in number. Male pilot whales can measure up to 25 feet in length and weigh up to 5000 pounds. The female of the species is generally smaller in length measuring about 19 feet and weighing in just short of 3000 pounds. This is an anti-tropical (cooler water) species with a usual habitat of deep open ocean but they have been been spotted in coastal regions depending on season. According to the Office of Protected Resources site, pilot whales are very social creatures and travel in large groups of up to 200 called pods. Whalers benefited from this by driving and herding them together into tight groups. The whales follow their food source in the waters consisting mostly of whiting fish, squid, and mackerel. The shore-based hunters in the Faroe Islands of Denmark continue this practice and it is a community effort for storing whale meat and products for the winter. Pilot whale meat and blubber is considered by islanders to be an important part of their staple diet. The whale meat is never sold, instead it is divided evenly to everyone who wants it. What ever is left over is donated to the local hospital and senior citizens on the island. There is very little of the whale that is actually wasted. The islanders use the blubber for processing oil, the skin for ropes and lines, stomachs for floats, and the esophagus for shoes. Pilot whales register high in mercury so pregnant mothers are warned against partaking in the meat. As for a ceremony of rite of passage, other than the traditional confirmation or getting married we found no evidence of a required whale hunt for the young men on this island. The communal processing is open to anyone on the island who regardless of age or gender. A whaling information site posted the actual description of the process of hunting, tools used and the legal regulations in Faroa. 3) Watch Dolphins are human too! 6) Watch WHAT'S KILLING DOLPHIN IN THE PERSIAN GULF? Powerful Kickers | Discovery News Video Nov. 24, 2008 -- Dolphins have a kick that would make Michael Phelps jealous -- 212 pounds worth. How dolphins are able to swim so fast first preoccupied researchers back in 1936, when zoologist James Gray calculated the drag dolphins must overcome to swim faster than 20 miles an hour. Gray said dolphins lacked the muscles to swim so fast, and yet they did. This became known as Gray's Paradox. Gray theorized that their speed possibly had something to do with their skin. Over the decades, scientists found flaws in Gray's work, and most biologists have rejected his theory. Now a team of scientists has used sophisticated underwater video to measure the power of a dolphin's tail. They calculate 212 pounds of thrust -- more than triple what a top Olympian like Phelps can produce and enough to swim with the zip that confounded Gray seven decades ago. Decades of overfishing, pollution, aggressive invasive species and severe habitat loss are threatening our oceans, yet we have no comprehensive national law to address these problems. Tell your representative to support a bill that would protect and restore our oceans and the economies that rely on them. Although the Navy agreed to limit its use of low-frequency sonar, it continues to blast the world's oceans with mid-frequency sonar, which can be just as harmful to whales and other marine mammals. Tell the Navy to turn off the noise. SAN DIEGO, Nov. 24 (UPI) -- Fishing activities are stunting population growth of a type of Pacific Ocean dolphin despite dolphin-safe practices, U.S. university researchers said. The study by Scripps Institution of Oceanography at the University of California-San Diego revealed negative impacts from fishing activities remain, despite adoption of regulations and agreements designed to reduce dolphin deaths from "by-catch" in which animals are caught unintentionally along with the intended targets. LONDON (Reuters) - Tests on some of the 25 dolphins which died after Britain�s biggest mass stranding in almost three decades showed they had been healthy, rescuers said on Tuesday, as mystery surrounded the beaching in a Cornish river. The dolphins died after they swam up the Percuil River near Falmouth on Monday morning and were left stranded. In what one rescuer called a "sea of carnage", marine experts, wildlife volunteers and vets battled all day to save the stricken dolphins. Seven were saved and led back out to sea. Investigators are exploring several possible causes, including the theory that the dolphins had become distressed by naval sonar equipment or were frightened by an unexplained explosion several residents reported hearing late on Sunday. Claims the animals had moved inland to feed on fish, attracted by a large algae bloom caused by a recent bout of hot weather, were dismissed after no food was found in their stomachs. While confirming it had a "presence" in the area, the Royal Navy said no training or official activity had been conducted there since last Thursday. A Navy spokesman also said officials had no knowledge of an explosion involving any vessels. At night below the ocean's surface, an intricate and coordinated "dance" occurs as spinner dolphins pursue and herd their prey of lanternfish, shrimp and small squid. Only by using hydrophones, devices that pick up sound waves in the water, have scientists obtained an intriguing glimpse of this captivating ritual. "We're not sure exactly how they coordinate their behavior," said University of Hawaii researcher Whitlow Au. "It sure indicates cognitive function." Co-researcher Kelly Benoit-Bird, a marine ecologist at Oregon State University and lead author of a study, said the dolphins encircle a school of fish at various depths and each pair feeds for about 15 seconds before allowing others to take a turn. The dolphin death comes at a delicate time for the Navy, which has appealed a federal court order imposing extra safeguards to protect whales from possible harm caused by mid-frequency active sonar. Researchers say it's too early to tell if exposure to Navy exercises caused its death. How many dolphins do you think it is reasonable to kill in order to catch the tuna? Tell why you think this. In the past 30 years, 6,000,000 dolphins have been killed by "fishing on dolphins". Some people want to protect the dolphins. These people are called conservationists. Conservationists say sacrifice zero dolphins. 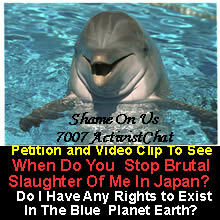 They think it is not reasonable to kill any dolphins. Not everyone feels the same way about dolphins. 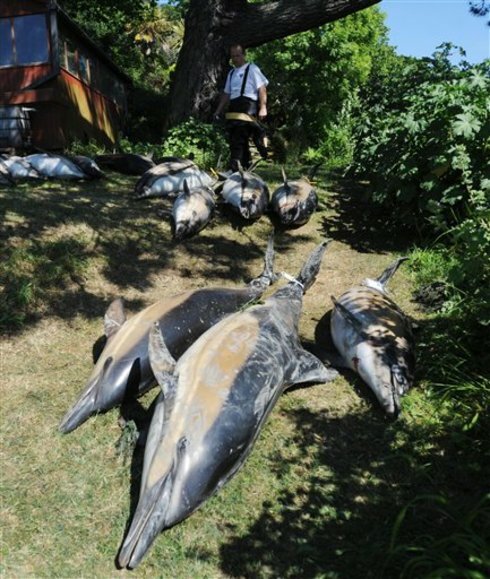 For one, the government of Japan classifies dolphins as "harmful marine mammals". Some fishers treat the dolphins as such. And when the U.S. government passed laws to limit the dolphin kill, some tuna fishers left the country. In some other countries, they could fish as they pleased. Fishers from Mexico, Venezuela, and the European Community continued to kill dolphins as they fished. Many people felt something needed to be done. One group of conservationists urged people to boycott yellowfin tuna. Boycott means "refuse to buy". Yellowfin tuna is sold as "light meat" tuna. The boycott tried to get tuna fishers to change the way they fish. Many people stopped buying the tuna. Some tuna fishers had trouble selling the tuna they caught. This section may be cited as the �Dolphin Protection Consumer Information Act�. (3) consumers would like to know if the tuna they purchase is falsely labeled as to the effect of the harvesting of the tuna on dolphins. During the afternoon of March 8, 2003 we received information from the Mali Lo�inj Marine police of a dead dolphin on the northwestern side of Ilovik. On March 9, 2003 researchers from the Adriatic Dolphin Project (ADP) went there to determine the cause of death. Preliminary inspection revealed a haematoma to the head indicating violent death. Through autopsy we determined multiple haemorrhaging and blood vessel ruptures in the body and organs indicating that dolphin died due to trauma caused by sudden change in the hydrostatic pressure. The dolphin was killed by the pressure wave caused by an explosive in the water.